Finding products that will enhance the beauty of your home while providing safety, is what every home owner wants. At Signature Iron Doors, you won’t get anything less. Each of our decorative iron pieces is hand crafted and finished to last the years. Interior railing is one of our specialties. Each piece is hand forged for your complete customized product. We have iron artisans and technicians who lead our team in providing your Signature product. 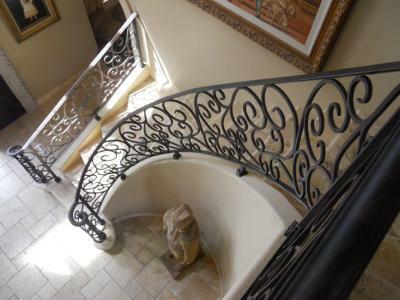 Featured above is a set of decorative iron railing we crafted for a family near Phoenix Arizona. Only a few months after meeting with them and discussing their needs, they had this exquisite set installed in their home. Please call us and come visit our showroom in Phoenix Arizona to discuss your interior ornamental iron needs and find out why Signature Iron Doors will enhance your home in just the way you want.